When word spread that Joe was leaving the Museum, offers began to pour in. The most persuasive was from Dion Boucicault who had written a play with Joe in mind. Robert Emmett opened in Chicago with excellent reviews for Joe, but with considerably less enthusiasm for the play. Boucicault was an incredibly prolific playwright and man of the theatre who would follow a strikeout by immediately tossing another ball in the air. He intended to keep Joe under contract performing in new works and revivals of his established hits like The Shaugraun, Colleen Bawn, and Arra-Na-Pogue. While the best of these Irish folk plays hold up well today, in their time they were regarded as unchallenging material for a serious actor. As Joe faced his future as a Boucicault actor, he received the following telegram: "Never mind Mr. Boucicault’s offer. You must write your epitaph on something higher than that. We will write our names on the immortal pages of Shakespeare. They look better there and live a great deal longer. Let me guide you up the dark, steepy path to glory. There are none that can follow you. Yours Truly, John McCullough." With that telegram, Joe came to a fork in the road that many actors of his generation faced: the choice between commercial success and artistic legitimacy. He had been offered a position as second leading man to John McCullough, a wonderful actor of the heroic school who had started his career with Forrest and was now a great and beloved star on his own. Joe sued Boucicault to get out of his contract and after a witty appearance on the witness stand, won his release. Joe was cast in the roles that John McCullough himself had played opposite Forrest, and McCullough gave Joe the same selfless mentoring that Forrest had given him. There was no star suppression of supporting talent under McCullough. Joe received $150 week (a considerable salary in 1882), and was made the feature of all matinee performances. McCullough saw Joe as an embodiment of dramatic genius and one of the splendid hopes for the future. One of the greatest actors in America had taken Joe under his wing, become his greatest teacher since Charlotte Crampton, and had become the father Joe had lost nearly twenty years before. McCullough arrived in America in 1847, fifteen years old and completely illiterate. That he could overcome this and become a great poetic actor is due to his industry and a phenomenal memory. He educated himself by memorizing encyclopedias, and astonishingly learned the massive role of "Robert Landry" in The Dead Heart in a single afternoon, performing the role letter-perfect that night. He was also an Adonis, with a natural physique that any gym bunny bodybuilder would die for. 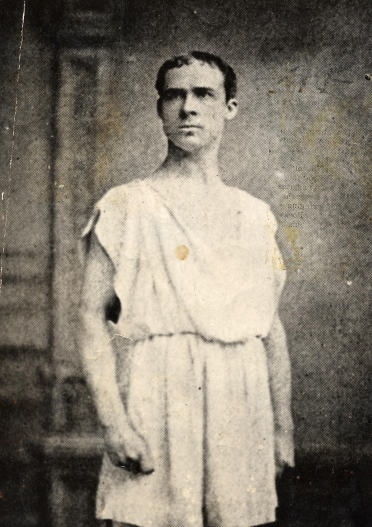 It was said that no one looked better in a toga than John McCullough, and several plays set in ancient Rome were always in the repertory. McCullough was "Spartacus" in The Gladiator, and the title character in Virginius, the Roman Father. In the latter play, the noble "Virginius" slays his only beloved daughter to save her from dishonor. McCullough would exit from that scene weeping profusely and shaking with emotion. He was able to completely believe in imaginary circumstances and to momentarily become at one with his character’s actions. Joe had a similar emotional instrument, and his work with McCullough both freed and deepened Joe’s emotional life as an actor. It was at this time that Joe first got the nickname "The Intense Actor." McCullough would always include challenging classical roles in his repertory. He was not always critically acclaimed as a Shakespearian actor, but the public regarded him as second only to Edwin Booth in classical roles. And McCullough did something throughout his career that confounded and impressed his most severe critics. He grew. Sometimes he grew in astonishing leaps. Sometimes the growth took the form of a gradual refinement of emotional, physical, and vocal effects. His years with Joe at his side were remarkable. Joe was "Laertes" to his "Hamlet," "Edgar" to his "King Lear," "Richmond" to his "Richard III," and "Iago" to his "Othello." In the latter role, Joe took New York by storm at the Fifth Avenue Theatre in 1884. And then it all came crashing down. McCullough began suffering memory lapses. At first, Joe was able to cover for his beloved "Governor" as he called him, but finally the problems became obvious to audiences and a struggling McCullough was booed and jeered under the assumption that he was drunk. McCullough withdrew and tried to recover, but his illness was progressive and he descended into madness. His family stated the diagnosis was a brain tumor. Apparently, the real cause was paresis resulting from congenital syphilis. Joe was at his bedside when he died.